Nepal has been ranked as one of the best countries in the world to visit in 2017, according to Lonely Planet’s annual Best in Travel list. Publishing the travel list for 2017 on Tuesday, the world’s renowned travel guide has said that Nepal is the hottest destination for all budget travellers while the country came out on the fifth place among top 10 countries of the list. “Nepal is the world’s number one destination in terms of service and value,” the Best in Travel 2017 list which showcases the top 10 countries, cities, regions and best value destinations for next year, added. The ‘travel bible’ notes that natural disasters can’t even keep Nepal down for long. Landmark temples crumbled, but others came through with just the odd tile out of place, and whole swathes of the country escaped serious damage, including most of the popular trekking trails, it added. According to the leading travel guide brand, Nepal has all the skills required to repair monuments and infrastructure, but what it does need is income. Nepal is bouncing back from earthquakes and a fuel strike that made getting round the country tough. “It remains a fabulous choice for budget-conscious travellers, who can access the best of its world-famous trekking routes and underrated wildlife for well south of US$50 a day,” it describes. 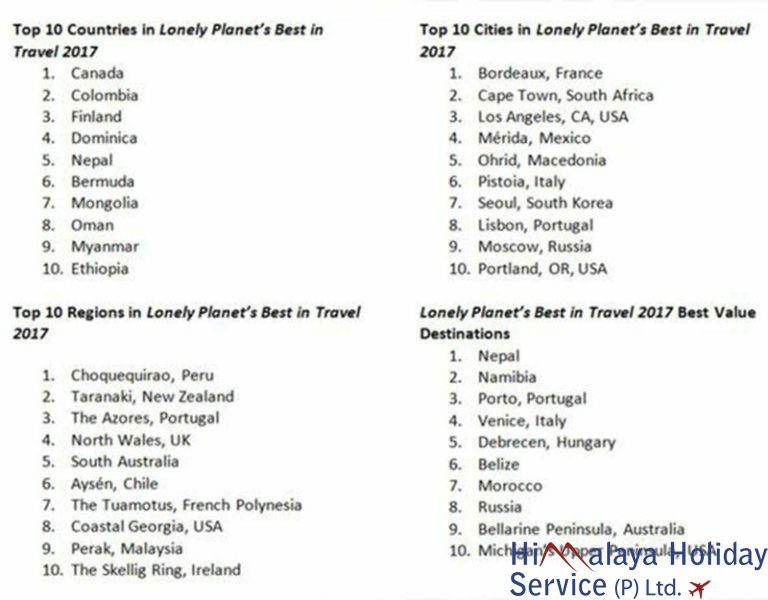 Lonely Planet’s listing certainly inspires the stakeholders as the country has already announced to mark 2017 and 2018 as ‘Nepal Visit Year’. Millions of customers around the world rely on Lonely Planet to help them travel, the company said. How politics is shaping tourism in Nepal, Bhutan and Tibet?